When it comes to food, there’s nothing better than a perfect pairing. 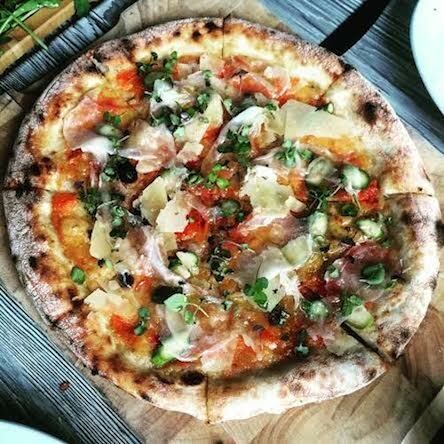 Classics like champagne and oysters, beers, burgers and fries and of course pizza and wine remind us that on their own foods like this can be great, but when paired up with their beverage soulmates, they are unstoppable. When it comes to pizza and wine, Buonanotte is one of those places in the city that not only make a great pizza, they feature one of the largest private collections of imported wine in the city. 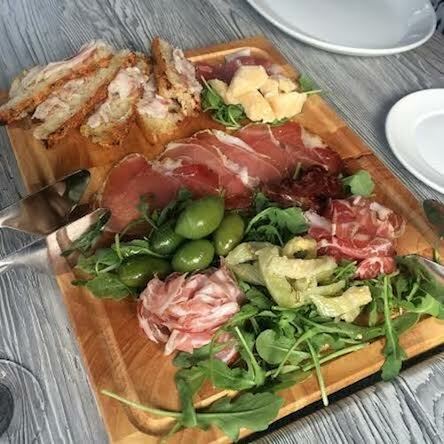 We joined the Montreal Food Divas and montreall.com a few weeks back at the world famous St. Laurent Italian eatery to sip on some wine and sample a few of their pizzas as they launched their summer menu. With perfect weather we gathered on the street level terrasse and were treated to an evening of pallet pleasing perfection. To kick things off, chef Marco Bertolini sent out a charcuterie plate filled with homemade charcuteries including prosciutto, pancetta, marinated eggplant, lardo, pieces of parmesan, olives and more. Served with a bold sparkling red wine (yes you are reading that right, red wine) our tender pallets were ready for more. Up next we were served a trio of delicious pizzas. 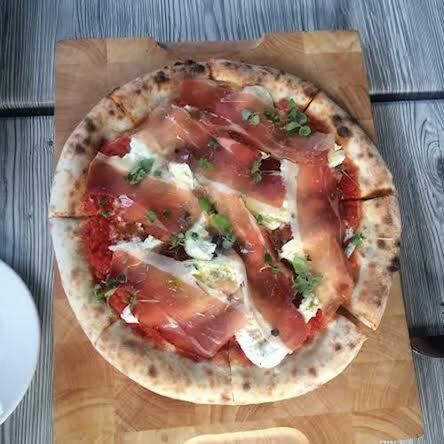 We have raved about the pizza at Buonanotte before but these pies were next level. First on this list was a pizza dressed up with thinly shaved prosciutto, creamy bufala mozzarella, fresh basil and a light tomato sauce. 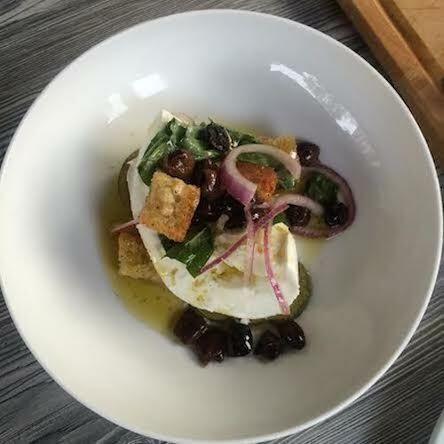 The creamy, cool bufala cheese was wonderfully fresh and the basil leaves added to that freshness. This was one of my favourite pizzas of the evening. Next up we were served a pizza topped with asparagus, lardo, pecorino and a sauce made from sweet hierloom tomatoes. For the uninitiated lardo can be a bit much to take but the saltiness of the razor thin lardo mixed with the sweetness of the tomato sauce was once again fresh, light and full of flavour. The last pizza of the evening came out just as the sun was setting over St. Laurent. Covered in homemade mortadella, arugula and shaved parmesan cheese with a light balsamic vinegar drizzled over everything, the pizza was easily the most familiar but it also happened to be the best (as far as I am concerned). Overall a pizza’s crust isn’t just the base on which we pile up ingredients, it’s also the base on which we judge the pizza itself. Buonanotte has one of the best crusts I’ve tasted in Montreal. But wait, there’s more. Becasue our arrival coincided with the launch of the new summer menu (and because I was seated with three hungry females – and the Buona PR guy, Fred) the food kept rolling out. We sampled several dishes that represent the lighter side of Italian fare including a delicious Panzanella salad (ripe with fresh heirloom tomatoes, buffalo cheese, olives, red onions and focaccia croutons), a tasty tomato tartar that stands out as one of the most interesting dishes I have eaten a Buonanotte, a zesty heirloom carrot salad that presents this rather normal vegetable in a way that makes it anything but bland. The carrots are roasted which adds depth to the flavor. 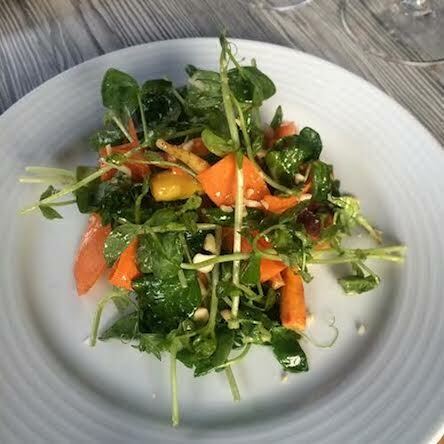 Resting on a bed of creamy black pepper bufala and served wtith smoked almonds and crispy peashoots, this dish is light but perfectly flavourful. Next out of the kitchen was an octopus dish that disappeared quite quickly. 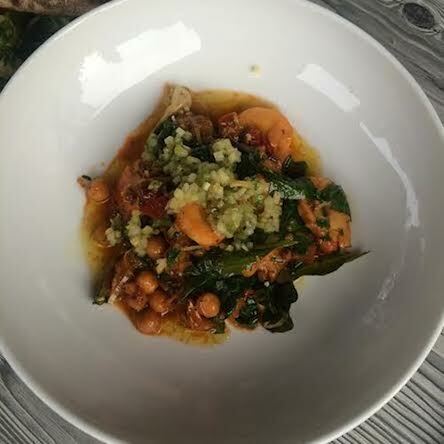 Though I sampled only a small portion (I’m not a fan of octopus by any means) I can tell you that the dish comes dressed to impress with homemade nudja, chickpeas and a heap of leek and cucumber sasla. The octopus was tender and well cooked while the accompaniment balanced the dish well. The last two dishes to arrive at the table were a delicious pasta and a duck magret. The pasta wasn’t typical by any means. 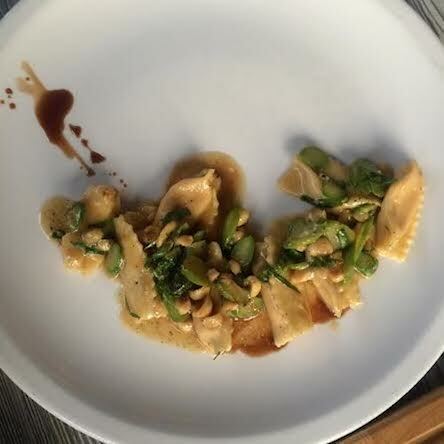 The dish, a carrot angolotti, came stuffed with a heirloom carrot and mascarpone filling and was topped with asparagus, hazlenuts and an aged balsamic. The balsamic tied the dish together perfectly, adding a light sweetness to the savoury dish. Much like the octopus earlier, the duck breast didn’t last long either. Despite almost a dozen courses, we had room right up to the last bite of the evening. 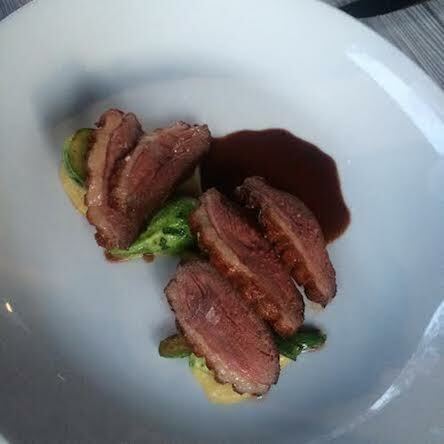 The duck was perfectly cooked to medium rare on the the inside and well crusted on the outside. It came served with a dollop of charred corn and a blackberry porcini sauce. Buonanotte doesn’t do anything small and their summer menu stands out with fresh, inspired dishes that fill you up but leave you not feeling like you over did it. A night on the their terrasse with a great glass of wine (it should be mentioned that Buonanotte is one of only four Montreal restaurants to recieve a two-glass designation from Wine Spectator – not too shabby) and a delicious pizza or one of the items from their menu is a great way to spend an hour or two. Perfectly located on one of Montreals most famous drags, Buonanotte remains not only a strong contender in our restaurant scene but they keep ahead of the game and continue to set the trends in wine and food. Special thanks to Fred and Lino for having us over.